Desperate times call for some desperate measures. Having lived a childhood with beautiful, long and thick hair, I never thought that I would be facing difficulty in maintaining their health as time passes by. Though the basic texture of my hair is good, thinning hairline along with bald patches on edges had started keeping me worried. Therefore, I just had to look out for a treatment plan, and I discovered a solution by reading multiple simplicity hair oil reviews and seeing how satisfied people were with the results. There are times when you have all the time in the world, and you can invest it in taking care of your skin, hair and health. But then there are days that you barely get time to even use shampoo for your hair once in a week and your hair start becoming un-shinier, dry and dull day by day but due to a busy schedule, you cannot do anything about it instead of waiting for a miracle to happen. I have always been among those who love the long and bouncy hair. However, unfortunately, now I have come to realize that my hair needed much more attention when my friends and family started inviting me over for get together and family dinners at Thanksgiving this year. It was the time when I wanted to look my best but how could I with such bad hair. I realized that I have a bad hair day, every day, all because I had stopped taking care of my hair as my mom used to when I was a small girl. Though I already had a feeling that my hair does not look good anymore since Thanksgiving, it hit me hard when I had to attend a friend’s engagement ceremony, but I could not get my favorite hairstyle as my hair had become thinner than ever before. People say that mothers are always right, I guess they are right when they say so. My mother always used to tell me not to get too many hair treatments done, and if necessary, I should take proper care of hair. However, since I was busy enjoying my good hair and keeping them up-to-date with the latest trends that I ignored the health of my previously beautiful hair. I have a naturally wavy texture of hair. So sometimes I like keeping them straight while sometimes I like curling them up, depending on the style that I am carrying for any occasion. Therefore, I used all kinds of hair styling products like hair curlers, straighteners, blow dryers, different gels, and creams, and got an extension done as well. In spite of using multiple hair styling products (some of which claimed to be good for hair), I failed to maintain health of my hair as I had no idea about what product to choose for nourishing my hair until I heard about the simplicity hair oil and the benefits of this oil for treating the damaged hair. I did have an idea about this hair oil being available in the market but never really had the time and motivation to find hair care solutions before. One of my friends, who by the way has thick and amazing blonde hair, told me to try this product out and see if it helps me improving the overall hair growth, and appearance. Though I received a firsthand review, it was a difficult thing for me to trust other people’s reviews blindly, so I did a little research on my own to find out whether I should give it a try or not. While searching for the simplicity hair oil reviews online, I came across may people, particularly celebrities like Tamar Braxton, Black Chyna, and Karrueche, who all used simplicity hair oil and seemed quite satisfied with the results that they achieved. Therefore, I decided to buy it and see if it works for my hair as well. I believe in using only those products that are suitable for me. I still remember my mom used to make a mixture of different oils, all having their respective qualities, for boosting my hair growth and make them shinier altogether. Sadly, gone are the days, but the closest hair oil that I found is simplicity hair oil. This hair oil is also a natural blend of various therapeutic and organic oils. The leaflet that came in the box with this hair oil lists all the ingredients. Some of the ingredients I came across included grapeseed oil, coconut oil, lavender oil, jojoba oil, tea tree oil, bay laurel, eucalyptus oil, sage oil, carrot oil, ylang-ylang oil, peppermint oil, lemon oil and rosemary verbenone oil. And thank God, I do not have allergies to any of the ingredients in this oil. So basically, the more, the better for me at least. Having used it myself, the simplicity hair oil is very useful especially for restoring the damaged hair strands. I felt the difference in edges also. The best thing that I like about simplicity hair oil is that it is not as greasy as other oils. However, it has a combination of different hair oils, but it is less greasy and does not smell bad also. I doubt about quality and contents of every product that I come across. From shampoos to body lotions, I want to make sure that I am using the right product for my skin. Therefore, I had my doubts when I tried the simplicity hair oil for the first time. The product description says that it contains natural essential oils only, which sounds true to me as it makes my hair soft every time I use it without witnessing any side effects so far. In a time when finding anything that is chemical-free is indeed a blessing and this hair oil is so far so good for me. I ordered simplicity hair oil just three months ago. For the first 15 to 20 days, I just kept looking at the bottle thinking about taking time out to try the oil and read its ingredients. Then eventually, by the end of that month, I got an off from work as I was feeling a little sick so I thought why not give myself a good scalp massage and try out the new oil as well. The ingredients on the pack seemed impressive, including at least four kinds of oil that my mom used to put in my hair. Before trying the oil, I thought it would be very smelly, but to my surprise, the smell was quite bearable. Then after that day, I decided to find out if it made my hair any better and started using it at regular intervals from then onwards. Using a dropper is the best possible way to apply hair oil without wasting it (especially when it is an expensive one). I use the dropper to target the front areas of the scalp, especially the hairline. Besides, when I use any hair oil, I make sure to let it absorb fully. Therefore, I started using simplicity hair oil at weekends; I put the hair oil on Saturday night and wash it off Sunday morning in the shower. It has now been three months that I have been using this hair oil, and I can say that it has started showing some positive results. However, I have heard that simplicity hair oil can also be used during conditioning or for the purpose of hot oil treatment. Though I still have to try hot oil treatment, I do have tried the hair oil in combination with the simplicity Moisture Conditioner and the results were perfect. My hair became manageable and super soft that I could not believe that my previously dull and dry hair could become so much better. Honestly, I did not see any positive results in the first month of usage except softer and shinier hair. Therefore, those who are expecting that this hair oil will work miracles right away are wrong. However, I did not stop using it since I thought the leftover oil would be wasted. Therefore, I continued and started seeing some more and better results regarding hair growth in the second month of usage. Before using the oil, my hair had become dry, dull and lately, I had started facing my worst nightmare, hair fall due to which, my edges started looking really bad. But luckily, I am now recovering. The previous bald patches now have small hair growth and empty spaces seem to be filling up. Though it took me three months to patiently wait and see the results, now I think that it was a good investment. Though the bottle containing oil is small, that does not make the oil any less effective. The bottle is dark blue in color. I guess the darker shade has been chosen to protect the oil from light. However, the dark shade can also become a hindrance in finding out how much oil is left in the bottle as one cannot easily look through the bottle and tell. But what I do is shake the bottle and roughly estimate the quantity (which is sadly nearing its end by now). One point that every girl would agree with me is that applying hair oil is one of the easiest things to do but washing it off is a big hassle. I always tried my best to avoid hair oil in childhood as I used to feel like I will never be able to wash it off. But to my surprise, simplicity hair oil in spite of having different natural oils is much easier to wash off as compared to other hair oils. This hair oil is greasy, but I feel lesser than others. While I used to wash and shampoo my hair around 2 to 3 times after every hair oil application, now with this one, I need to shampoo my hair just once, and voila, I have no oil left in my hair anymore. 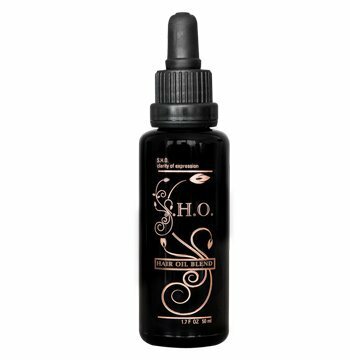 The simplicity hair oil is a little more expensive than some other hair oils available in the market, which is why many people feel a little hesitant about purchasing it. I also gave it a second thought because I had never before used it. It is true that buying such an expensive hair oil every 2 to 3 months is not easy in the pocket and so, I am thinking to finish up the first bottle and wait for a couple of more months to buy another one and meanwhile avoid using harmful hair styling products. When I was in a hassle-free solution for maintaining the health of my hair, simplicity hair oil became my savior, but that might not be the case with everyone out there. This oil is a combination of 14 different natural oils some of which might not be suitable for everyone and some might even be allergic to some of the ingredients. The simplicity hair oil is expensive, but keeping in mind that it is free of artificial colors, chemicals, preservative and fragrance, this hair oil is worth the investment in my opinion. While going through various simplicity hair oil reviews recently, I came to know about other simplicity hair care products like shampoo and moisture conditioner. Though a friend of mine highly recommends it, I am planning to keep using the oil for a while first, and if in the upcoming months I see extraordinary results, I will surely invest in buying the complete hair care kit.